"Crazy Egg is an analytics tool that works like an x-ray on your website to see where users click and scroll on your site." 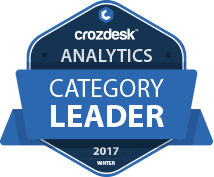 Crazy Egg scored 91/100 in the Web Analytics category. This is based on user satisfaction (93/100), press buzz (60/100), recent user trends (rising), and other relevant information on Crazy Egg gathered from around the web. 4.63/5 based on 8 user ratings. What do you like about Crazy Egg? A great way to understand how your users interact with your website, and see why they drop out of funnels and don't convert. Great heatmap function, for every landing page. Good recordings with speed adjustments. What do you dislike about Crazy Egg? What have you been using it for and what problems did Crazy Egg solve? Great tools, easy integrations and recordings. The best tools for a developer or designer, in order for them to understand what is missing from visitors to convert into customers. I have been using it for a couple of freelance projects, it helped me understand why visitors are not converting, and what they want.